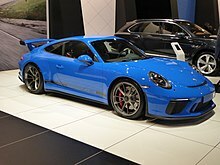 The 3.8-litre unit found in the 911 GT3 is replaced with a 4.0-litre unit with 500 hp (370 kW) and 339 lb ft (460 N·m) of torque. The transmission is PDK only. The drivetrain delivers 0-62 mph (100 km/h) in 3.4 seconds (0.6 seconds quicker than the 997 GT3 RS 4.0) and 0-124 mph (200 km/h) in 10.9 seconds. The 991 GT3 RS also comes with functions such as declutching by "paddle neutral" — comparable to pressing the clutch with a conventional manual gearbox ���- and Pit Speed limiter button. As with the 911 GT3, there is rear-axle steering and Porsche Torque Vectoring Plus with fully variable rear axle differential lock. The Nürburgring Nordschleife time is 7 minutes and 20 seconds. The 997 GT3 RSR has scored many class victories around the world, including first-place finishes at the 2011 and 2013 Petit Le Mans. The 997 GT3 RSR set a Nürburgring Nordschleife lap time record for non-turbocharged cars at 7:07 while driven by Sabine Schmitz.